Financial support and the Marquis de Lafayette were only parts of France’s contribution to America’s success against England. Shachtman (Gentlemen Scientists and Revolutionaries: The Founding Fathers in the Age of Enlightenment, 2014, etc.) shares the stories of the many Frenchmen who fought with the Americans against England. Suffering from military cutbacks and reparations from the Seven Years’ War, and attracted by merit promotions rather than their own class-based system, French soldiers eagerly sought commissions in the American Army. Silas Deane, the American agent procuring a commercial alliance for war materiel, was quick to grant French appointments. Hundreds applied, and many were spectacularly qualified, including Louis Duportail, Comte de Ségur, and Vicomte de Noailles; others were supremely incompetent and arrogant bores. Many volunteers refused to serve under George Washington. In fact, Continental Army officer Johann de Kalb planned to replace him with Victor François de Broglie. The Marquis de Lafayette, on the other hand, agreed to serve as an assistant to Washington, becoming as close to him as any son. Shachtman astutely explains France’s point of view as she protected her West Indies holdings, sought a new profitable foreign market, and worked to undermine England. Rather than form an alliance, at first France’s foreign minister, Charles Gravier, encouraged French merchants to ship gunpowder through France’s ports, provided havens for privateers on the sugar islands, and helped Deane obtain supplies. Washington, desperate for French-trained engineers, was delighted to have help in delaying British forces on the Delaware. He relied on Duportail’s counsel for the majority of strategic decisions and accepted his advice to follow a Fabian strategy, avoiding engagement. The author also brings to light France’s continuing pressure on Spain to help. While she never recognized independence, Spain provided invaluable economic and military help in the Floridas and Caribbean. 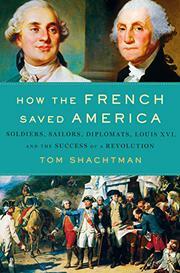 The author makes a convincing case that, without France, the United States may never have gained independence.